Each tin contains 5 packs. Each pack contains 9 cards. 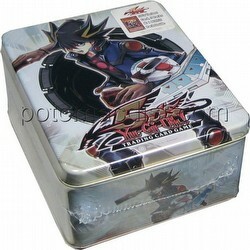 These tins were originally a retail exclusive for Wal-Mart stores. Each tin includes 2 Duelist Genesis, 1 Phantom Darkness, and 2 Light of Destruction booster packs as well as a promo token pack and Montage Dragon promo card.